The postsecondary education landscape in Texas has undergone radical change in the last 15 years. The demographic that drives most of the current revenue in the state is gradually aging out of the workforce, and to maintain a healthy economy, a younger population must be adequately equipped to replace these retirees. Fortunately, alert Texas legislators foresaw obstacles to this pattern and further identified the demographic changes contributing to a potential statewide shortage of degreed professionals. What followed was a sea of change in educational policy across the state that resulted in a dramatic increase in educational offerings. Many believe these positive changes are only the beginning and that Texas will have much more to offer its college students over the next decade. 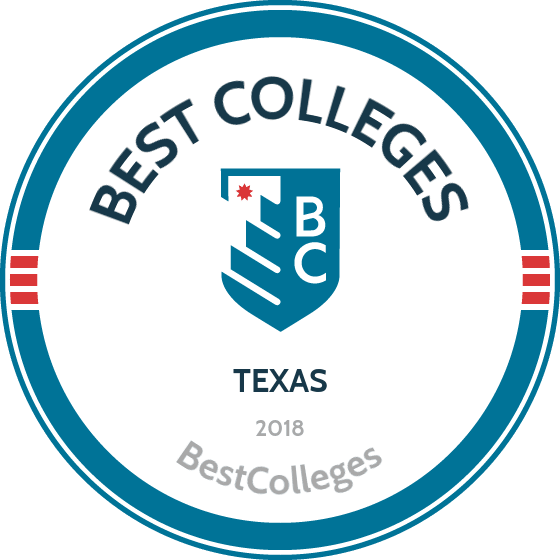 We have applied our rigorous methodology to the most current education data available and have created ranked lists of Texas' best two-year and four-year colleges. As one of the largest colleges in Texas, UT in Austin currently serves more than 51,000 students at all academic levels. As the flagship institute of the University of Texas system, the school has educated more than half a million students since opening its doors in 1883. Undergraduates make up nearly 80% of all enrolled students and currently take advantage of more than 170 areas of study divided among 13 colleges and schools. Unique programs at the school include architectural engineering, geosystems engineering and hydrogeology, American studies, and textiles and apparel. When they aren’t in the classroom, Longhorns have unlimited options for participating in campus and local community life, including more than 40 programs solely working to encourage diversity and promote inclusivity. Among the notable students, alumni, and faculty are 112 Fulbright Scholars, 31 Rhodes Scholars, and 23 Marshall Scholars. Named after the businessman and philanthropist William Marsh Rice, Rice University in Houston has been a leading research university since its inception in 1891. With a focus on diversity and intellectual inquiry, the university has risen the ranks of the best colleges in Texas. As a selective institution of more than 6,600 undergraduate and graduate learners, there were 19 applicants for each available place in the latest group of incoming freshmen. More than 50 baccalaureate degrees are currently offered through six areas of study, including architecture, engineering, humanities, music, natural sciences, and social sciences. Standout programs include material science and nanoengineering, visual and dramatic arts, kinesiology, and policy studies. As a comprehensive research institution, the school boasts 51 research centers spread across academic disciplines in addition to dozens more research groups in areas of biosciences, chemical engineering, computational and applied mathematics, and chemistry. One of the Texas colleges operating as a member of the Texas A&M University system, the College Station location provides education to nearly 68,000 annually from its flagship campus set equidistant to Houston, Austin, and Dallas. The school, opened in 1871, was originally formed to provide agricultural and mechanical education, but today hosts more than 130 undergraduate degree paths from 19 different colleges and schools. Whether hoping to be a future aerospace engineer, entomologist, philosopher, or manager of rangeland ecology, the programs offered at TAMUCS take into account both the current job market and students’ skills and passions. Athletics are also intrinsically part of what it means to be an Aggie; the school currently has more than 650 student athletes participating in 20 different varsity sports at the NCAA Division 1-A level. Students can also take part in one of the hundreds of student clubs or organizations on campus. At its heart, UTRGV is about community. The school aims to solve complex issues with global implications, to improve the lives of its students, and to care for the health of its surrounding area. Offering 118 undergraduate and graduate degrees in seven colleges and a newly opened School of Medicine, UTRGV is the 10th-largest university in the state. With more than almost 28,000 students, it’s also recognized as one of the top US universities for Hispanics. UTRGV offers a distributed campus that spans more than 150 miles of South Texas. This broad footprint grants students access to cutting-edge research facilities that traverse outer space, the seafloor, and the manufactured world. Students engage in research early in their academic career with internationally recognized faculty -- both in the classroom and at the Center for Gravitational Waves Astronomy, the South Texas Coastal Research Center, the Nanotechnology Center of Excellence, the Institute for Neuroscience, and the South Texas Diabetes and Obesity Institute, among others. As one of the premier Texas colleges operating in the northern part of the state, UT Dallas has grown from its humble beginnings in 1969 to serve tens of thousands of students through nearly 140 degree programs. Operating under the tradition of being “not-so-traditional”, the school is continually recognized for excellence in education and experiential learning. As one of the best research institutions in the state, both undergraduate and graduate students have the opportunity to take their learning outside the classroom and test ideas with some of the leading minds in academia. With 51 undergraduate degrees currently offered, baccalaureate-seeking students can pursue degrees in areas of Latin American studies, applied cognition and neuroscience, justice administration and leadership, and healthcare studies, among others. For cost-conscious learners and their families, UTD is considered to have the third-best return on investment (ROI) of any other public institution in the state, while also preparing graduates to move quickly into a career or further education. The University of Houston breaks enrollment records each academic year, and for good reason. As of 2016-17, more than 42,000 students have chosen UH above all other Texas colleges. With more than 2,300 faculty members providing instruction in 120 areas of undergraduate study, students of all academic stripes can find a program tailored to their needs. Outside of pioneering studies in areas of biotechnology, entrepreneurship, industrial design, and management information systems, motivated learners can also apply for the Honors Program to take part in a truly exceptional, personalized academic experience. Research also plays a big part in life at UH, with more than 25 research centers and institutions led by 1,000 faculty -- including 13 National Academy of Engineering Members, four National Academy of Science members, one Nobel Laureate, and 46 winners of the National Science Foundation Career Award. As one of four Texas colleges operating within the University of Houston system, the Clear Lake campus opened its doors in 1974 with the express purpose of providing educational programs to NASA employees. Because of these illustrious beginnings, notable alumni include a number of astronauts, physicists, and engineers with distinguished histories in space exploration. Today, the school provides education to nearly 8,500 learners annually in undergraduate areas of study ranging including aeronautical studies, arts and community, and politics and human behavior. As an added bonus, the 524-acre campus in the upper Gulf Coast of the state is nestled on a wildlife and nature preserve. For learners seeking a diverse campus, UHCL could be a perfect match: Hispanic, African American, Asian American, Native American, and international learners comprise 61% of the student body. TCU’s Fort Worth Campus, comprised of more than 10,000 students, offers 119 undergraduate areas of study in addition to more than 80 master’s and doctoral programs for graduate students. Whether planning to study movement science, Chinese, dietetics, or speech-language pathology, TCU is one of the Texas colleges that knows how to cater to student aspirations across the academic spectrum. Athletics are also a huge part of what it means to be a Horned Frog: student athletes currently participate in nine men’s teams and 12 women’s teams. Common sports available include basketball, cross country, golf, swimming and diving, tennis, and indoor/outdoor track and field. A variety of intramural sports are also available to students who want an athletic outlet, and over 230 student organizations are open to students on campus. Notably, the school has a freshman-to-sophomore retention rate of 91%, and around 85% of students are employed or in grad school within three months of graduation. Established by and named after one of the founding fathers and inventors of earthmoving equipment, LeTourneau continues to receive inspiration from its namesake by providing groundbreaking education. Originally founded in 1946 as a technical institute for educating returning World War II veterans, today more than 2,700 students are enrolled in programs taught from the schools of arts and sciences, aeronautical science, business, education, engineering technology, and nursing. Outside the range of bachelor’s degrees available, the school also has certificates, diplomas, associate degrees, and graduate programs, making it one of the most expansive of the Texas colleges in this ranking. As an “unapologetically Christian” institution, LeTourneau offers services and resources combining education and Christian teachings, including the Center for Faith and Work, an innovative program that helps students and alumni find ways to incorporate their faith into any professional field they pursue. LU is also a popular option for previously homeschooled learners: in the latest incoming class, home-educated students accounted for 26% of the 256 newly enrolled freshmen. Offering a liberal arts education, Trinity is the first of the private Texas colleges in this ranking. Founded in 1869, the institution is still completely in sync with its mission to be “a university of the highest order.” Home to just over 2,300 undergraduates, Trinity is the perfect place for students who want small class sizes and close interaction with professors and administrators. A selective institution, incoming students have an average GPA of 3.5 and ACT score of 29.2. Nearly 50 undergraduate programs are currently on offer, including ancient Mediterranean studies, business analytics, computing as a second major, and mathematical finance. For high school seniors worried about making the leap to college life, have no fears: the university’s “First Year as a Tiger” program was developed to ensure every student is immersed in a caring, attentive community that gets them plugged into residence call life, student clubs and organizations, and opportunities for service learning. Operating as one of the many Texas colleges with a Christian heritage, Southern Methodist University is a thriving private institution in the heart of Dallas that caters to 11,000 students from all 50 states and 90 different countries. Mustangs are currently taking advantage of more than 150 majors and 74 minors at the undergraduate level, including fascinating studies in topics like arts entrepreneurship, archaeological anthropology, electrical engineering, and geophysics. SMU provides students with dozens of services and programs. There are currently 25 research centers and institutes working to answer questions of international interest, in addition to 10 different libraries containing the largest collection of materials of any other private institution in the Southwest. Located five miles north of the downtown area, students have the advantage of enjoying a 234-acre campus with ample green areas, and are a short ride away from all that a large metropolitan city has to offer. Nationally ranked as one of the best colleges in Texas, Baylor University is a private Christian school that caters to 16,000 learners each academic year. The 1,000-acre campus just outside Waco is located on the Brazos River and provides an idyllic setting for both academics and leisure. A multicultural school, 34% of the current freshman class identify as a minority student. Career preparation is a big part of Baylor’s mission, and it seems to be effective: 87% of students secure jobs or start a graduate program within three months of graduation. While still in school, learners take advantage of 142 undergraduate programs, including degrees in Arabic and Middle East studies; astrophysics; exercise physiology; and great texts of the Western tradition. As a member of the Big 12 Conference, this NCAA Division I school takes sports seriously. The women’s basketball team has the distinction of being two-time NCAA national champions, while the school has also been home to four Olympic gold medalists. Another one of the largest Texas colleges (the institution currently serves 40,000 students), TSU in San Marcos sets itself apart by being one of the most diverse campuses in the nation. With ethnic minorities comprising half of the student body, learners who attend TSU are guaranteed a multicultural experience where learning doesn’t just take place in the classroom. Originally formed in 1903 as a teacher preparation college, today the school provides nearly 100 bachelor’s degrees and is the largest public university in the TSU system. The nearly 500-acre campus includes 209 academic and research buildings and is supplemented by an additional 4,000 acres used for academics, agriculture, research, and recreation. For students seeking a unique learning path, some of the more innovative offerings include applied sociology, clinical laboratory science, physical geography, and technology management. As the first of the Texas colleges following a Catholic tradition in this ranking, the University of St. Thomas in Houston is uniquely positioned to serve students seeking religious heritage alongside intellectual inquiry. Undergraduate degree programs are taught via six different schools focused on arts and sciences, business, education and human services, nursing, and theology. The newest building, the Center for Ethical Leadership, brings together students, faculty, visiting lecturers, and leaders within the movement to educate students on the importance of ethical leadership in the 21st century. Aside from a range of pre-professional programs in topics like law, dental, or pharmacy, learners have degree options ranging from bioinformatics and drama to mathematics and social entrepreneurship. For students worrying about the cost of a private education, the average financial award package during the latest academic year was $20,607, with 86% of all undergraduates receiving some type of financial aid. Overlooking Mountain Creek Lake in the rolling hills of southwestern Dallas, students enrolled at one of the best Christian colleges in Texas enjoy not only excellent learning opportunities, but also a beautiful 300-acre campus. Founded in 1898, DBU has stayed true to its mission of developing servant leaders while transforming lives. The university’s current population of 5,100 learners enjoy undertaking 73 undergraduate degrees as well as 29 master’s degrees, 55 accelerated degrees, 62 dual master’s degrees, and 2 doctoral degrees. For students who know they want to complete advanced studies, DBU offers numerous accelerated bachelor’s and master’s degree programs, most of which can be completed in five years of full-time study. Students who don’t want to live on campus but are a bit too far from the main campus can take advantage of the Hurst-Colleyville campus, which opened in 2005 and serves students living in Tarrant County. Lubbock’s Texas Tech was founded in 1923 and currently serves more than 36,000 students from 10 colleges focused on topics like architecture, arts and sciences, business, agricultural science, engineering, and more. As the largest school in the western two-thirds of the state, TTU is also home to a law school and medical school. Current learners are enrolled in 87 different undergraduate degree programs, studying topics ranging from energy commerce and food sciences to landscape architecture and natural resources management. For the academically focused learner, TTU’s Honors College provides a small, intellectually rigorous environment that pulls topics from many different areas of campus to create a truly unique learning experience. Outside of academics, the university’s Center for Campus Life is home to a range of standout extracurricular programs, including fraternities and sororities, the LBGTQIA society, a peer financial coaching service, the spirit program, and the student government association. Offering 101 bachelor’s degrees in addition to master’s and doctoral programs, UNT in Denton is consistently praised as being one of the best colleges in Texas. Located less than an hour from Dallas and Fort Worth, the school is also perfectly placed as an institution catering to residents in North Texas and beyond. As a major public research university, the 38,000 currently enrolled students enjoy opportunities to grow their experiences outside the classroom. Programs of interest include business integrated studies, ceramics, home furnishings merchandising, and risk, insurance, and financial services. Once enrolled, learners enjoy a vibrant campus life; the campus hosts 15 residence halls, several different dining options, multiple libraries, the Pohl Recreation Center, and more than 1,000 concerts, exhibitions, and productions staged annually. UNT students are also encouraged to take advantage of all that Denton has to offer, including one of the best main streets in America, according to a recent report by Fodor’s. Based in McAllen, STC serves the Rio Grande Valley region of Southern Texas. The school educates more than 34,000 students across several regional campuses. As one of the largest community colleges in Texas, STC offers more than 121 academic programs, including associate degrees, bachelor's degrees, and professional certificates. The college offers associate programs in business and technology, math and science, liberal arts, social and behavioral science, and nursing and allied health. Some of STC's professional degree choices include pharmacy technology, fire science, construction supervision, and welding technology. The school also offers bachelor's degrees in computer and information technologies, technology management, medical and health services management, and organizational leadership. STC is one of the state's largest providers of dual enrollment for high school students. The school also maintains articulation agreements with many of the state's top colleges, allowing students to easily transfer to a four-year institution. Southwestern has offered quality educational programs for more than 175 years. Operating as a private liberal arts college close to Austin, more than 15,000 students currently call the university home. Experiential learning is at the heart of a Southwestern education. More than half of all students have completed at least one internship, and 91% have found employment or have been accepted to a graduate program within less than a year of graduation. With programs such as architecture, German, feminist studies, and physical science, SU’s more than 40 majors and minors provide many choices. One of the more unique offerings is Paideia, a cohort-based learning experience focused on providing interdisciplinary, integrative, and intentional learning around areas of study that students may otherwise not have the opportunity to pursue. Sitting outside San Antonio and Austin, Texas Lutheran has been providing education rooted in the Christian tradition since 1891. As one of the Texas colleges operating as a private arts and sciences institution, TLU is unique in its commitment to expanding professional studies to learners seeking a liberal arts foundation alongside practical learning outcomes. Although some learners may be concerned about the price tag of a private education, 99% of all students receive some type of financial aid to lessen the burden. As an NCAA Division III school, male and female student athletes can take part in eight different varsity teams. Undergraduate students pursue degrees in 29 different majors, including studies in aeronautical science, athletic training, dramatic media, and social innovation/social entrepreneurship. Students who want to take full advantage of attending a Christian institution may consider becoming part of the Campus Ministry outreach program. Tarleton is a member of the prestigious Texas A&M University System, and more than 13,000 students attend the school each year. The university offers more than 100 degrees from the associate to doctoral level. Some of Tarleton's unique academic programs include digital media studies, geographic information systems, veterinary sciences, and histotechnology. The school maintains several research centers, including the Texas Institute for Applied Environmental Research, the Texas Social Media Research Institute, and the Southwest Regional Dairy Center. The college emphasizes applied learning, with experiential activities such as research, service learning, cultural enrichment, leadership building, internships, and practicum experiences. Undergraduate and graduate students have the opportunity to participate in study abroad programs. This includes faculty-led programs, reciprocal exchange programs, internship and volunteer opportunities, and short-term group trips. Undergraduate applicants should submit SAT or ACT scores. Graduate applicants should submit GRE, MAT, or GMAT scores. WTAMU, located just south of Amarillo in Canyon, was founded in 1909 as a teacher's college. Today, this comprehensive public school serves more than 10,00 students through 100 graduate and undergraduate programs. Some of the college's notable undergraduate degrees include agribusiness, civil engineering, communication disorders, and wildlife biology. Graduate programs include educational diagnostician, plant science, criminal justice studies, and animal science. WTAMU offers learners the chance to participate in student government, Greek life, recreational sports, and student clubs. There are several organizations dedicated to student leadership, including the National Society of Leadership Success and the Emerging Student Leadership Academy. WTAMU consistently ranks among the top public colleges in Texas, and some of its most prominent graduates include former Valero CEO William R. Klesse, young adult author Jennifer Archer, and NBA player and coach Maurice Cheeks. Created by a charter modeled after those used by Ivy League schools in 1849, Austin College has the distinction of being one of the oldest colleges in Texas. An independent liberal arts college located just north of Dallas, Austin College currently offers more than 50 undergraduate areas of study in topics you can’t find at every institution. While traditional studies in business, biology, English, and music are some of the most popular programs, groundbreaking studies in topics like ethics, global management, nonprofit organizations, and Western intellectual tradition are also gaining traction among learners who wish to think outside the box. For students who plan on continuing their learning after earning an undergraduate degree, the Gateways to Graduate School Program helps students address questions about admissions and scholarships while also advising about advanced undergraduate coursework to make the transition to a master’s program more smooth. Located in San Antonio, Hallmark is a professionally-focused private college that emphasizes education in business, aeronautics, healthcare, and technology. Hallmark uses an accelerated course format that allows students to complete their degree almost twice as fast as they would at other colleges in Texas. The school’s MBA in global management requires just 14 months to complete, compared to the standard two years. Hallmark follows an objective-driven system that highlights professional skills and competencies. Scenario-based learning components simulate real-life uses of professional skills. Industry relevance is important to Hallmark, and the college designs its programs in consultation with advisory committees that include company leaders. The school strives to help students stay ahead of changing technologies, trends, and licensing requirements. Hallmark also offers an education guarantee to all graduates: within two years of graduation, any former student may audit any class to refresh knowledge or meet updated professional, licensing, or training requirements. TKU, based in the Dallas-Fort Worth suburb of Southlake, is a private, evangelical college affiliated with the Gateway Church. The school serves a small student body of around 400 and offers a variety of degrees at the undergraduate, graduate, and doctoral level. Most programs focus on ministry, Christian studies, and theology. The school also offers an undergraduate program in media arts, which explores audio, video, and other multimedia production skills through a Christian context. TKU offers a portfolio development program that allows skilled students to provide evidence of previous learning for academic credit. Student portfolios may demonstrate professional experience such as work training, military service, or community organizing. Academic advisers then evaluate the portfolio and determine its relevance to academic work. Prior learning programs and an affordable tuition rate make TKU one of the least expensive private schools in Texas. What started as a small school with 200 students in the spring of 1946 has grown into Wharton County Junior College, one of the preeminent two-year colleges in Texas. More than 6,000 learners currently make up the school roster, including additional learners who are not enrolled in for-credit programs. The school is eager to help learners understand the benefits of postsecondary education: WCJC estimates that students enjoy an average annual income increase of $158 for every credit completed. The school has more than 20 AA, AS, and AAS degrees on offer, including studies in agriculture, drama, engineering, and speech. Can’t make it to the main Wharton campus? The school also has locations in Bay City, Richmond, and Sugar Land. Topping the 2017 ranking of the best community colleges in Texas is Northwest Vista College, a member of the Alamo Colleges District. Nestled in a beautiful 137-acre campus in San Antonio, this open-door admissions college prides itself on having no minimum requirements for entrance while also providing a small, communal educational experience where classes typically comprise no more than 25 students. The 33 associate degrees currently offered are spread evenly among associate of arts (AA) and associate of science (AS) degrees. AA and AS degrees from Northwest Vista prepare learners for further study, while associate of applied science (AAS) degrees are geared towards students who plan on immediately entering the workforce. If you’re looking for a unique topic, look no further. Studies are available in areas such as game development, new media arts, 3D animation, and water resource science. Part of the five-school Alamo Colleges District, Palo Alto College serves learners in the Bexar County community. The school offers learning opportunities for freshmen and students seeking to transfer. Distance learners can earn associate degrees in as few as two years of full-time study. Students can choose from associate of arts degrees in subjects that include advertising, business, computer science, journalism, and Mexican American studies. Aspiring teachers can pursue an associate in arts in teaching in preparation for Texas teacher certification in grades EC-6, 4-8, and EC-12 special education. This AAT seamlessly transfers to public four-year colleges in Texas that offer baccalaureate degrees leading to initial teacher certification. Additionally, the school offers a full roster of associate of applied science degrees, which helps drive PAC's reputation as one of the top community colleges in Texas. Many PAC students transfer to four-year schools, and the institution holds articulation agreements with several senior colleges. As one of the most culturally diverse two-year colleges in Texas, students from more than 130 countries make up the 25,000 student population at Richland, and nearly 80 languages are spoken on campus. Richland is the only community college to be the recipient of the Malcolm Baldrige National Quality Award, bestowed by the White House and the Department of Commerce. Nearly 60 associate degrees currently make up program offerings, with innovative studies in areas of travel, exposition, and meeting management; interactive simulation and game technology; geology and environmental science; and criminal justice. Learners looking to get the most out of their education may consider joining the Honors Academy, taking part in numerous learning communities on campus, or joining one of the school’s centers and institutes for research. To ensure all international students are cared for, Richland offers ESL classes, the multicultural center, and the American English and Culture Institute. With more than 53,000 credit and non-credit learners enrolled during the 2016-2017 academic year, it’s safe to say that the Collin College is one of the largest community colleges in Texas. The current school includes three campuses in McKinney, Plano, and Frisco, in addition to other learning centers throughout the area. Providing education for over 30 years, the school shows no signs of slowing. Recently, the college unveiled a visionary master plan that would add programs and locations to meet workforce demands for training and education. Collin College is home to eight Carnegie Professors of the Year, a feat unmatched by any college or university in the state of Texas. Through a tradition of academic excellence, the college offers 11 associate degrees, certificates and marketable skills achievement awards. Some of the available paths include business, criminal justice, computer science, engineering, and teaching. For students who who desire flexibility, Collin College’s Weekend College allows learners to complete standard semester-long courses by meeting once a week on Friday, Saturday, or Sunday evenings. College of the Mainland operates a main campus in Texas City as well as five regional learning centers. COM oversees a comprehensive catalog of programs that lead to associate degrees. The school awards several technical and science technology degrees, which land graduates some of the highest starting salaries among associate degree holders in the state. After two years of full-time study, students can earn an associate of applied science in drafting, fire technology, petrochemical process technology, or occupational safety and health technology. Additionally, the school's AAS in business administration gives students the choice of two tracks: marketing and accounting. Learners who want to pursue healthcare careers may opt to enroll in AAS degree plans in medical assisting, health information management, emergency medical services, or pursue an associate degree in nursing. One of the top community colleges in Texas, COM also gives students opportunities to earn a certificate in as few as two semesters. COM provides comprehensive support services to its students, including math tutoring and access to a reading and writing center. North Lake College offers 64 associate degree programs which are conferred through six departments, including construction technology and logistics technology; liberal arts; nursing; visual and performing arts; sports science; and workforce, business, and technology. For learners looking for programs specialized to their needs or interest, the college also has a vibrant field studies program, the Sage Scholars Honors Program, and a minority male initiative to help attain and retain students within this population. North Lake’s campus boasts a 380-seat performance hall, a 59,000-square-foot library, a 2,000-seat gymnasium, an Olympic-sized natatorium, a 10,000 square-foot workforce development center, and a DART light rail station. The school also offers three satellite campuses available for students who can’t get to the North Lake Campus, making it one of the best community colleges in Texas for commuting students. One in a network of career colleges, Remington College in Houston specializes in programs that prepare learners for in-demand fields in the region. The school offers four associate degree programs in criminal justice, medical assisting, medical assisting with an X-ray tech track, and business office management. All programs include foundational general education requirements as well as specialized, major-related courses. Full-time learners typically complete their program in 18-24 months. The medical assisting associate degree track discusses administration in medical offices, teaching learners how to prepare patients and deal with insurance billing. Students learn competencies through hands-on training and an externship. Individuals can also opt to follow the X-ray tech track, where students study limited medical lab procedures, radiologic basics, radiographic imaging protocols, and radiographic positioning. One of the top schools in Texas, Remington College also administers a full bachelor's degree in criminal justice. Established 50 years ago, Texas State Technical College operates campuses in 10 locations across the state, including one in Harlingen. The school maintains its position as one of the top community colleges in Texas due in large part to its comprehensive roster of offerings. Students can earn dozens of associate degrees in as little as two years in fields that include biology, mathematics, and physics. TSTC's academic core curriculum transfers to a public senior college in Texas, serving as the first two years of a four-year degree. Students interested in pursuing a trade can become career-ready in as few as 18 months by pursuing associate degrees in fields such as construction technology, automotive technology, electrical line working, and agriculture technology. The school also administers some fairly unique programs, such as mechatronics, which is a degree plan that combines several disciplines to solve industrial problems. TSTC also hosts a certificate program in energy efficiency, teaching individuals to conduct energy audits of facilities and process systems. With five campuses spread throughout the city of El Paso, learners who want to earn an associate degree or certificate have several options at El Paso Community College. As one of the few community colleges in Texas serving a part of the state where the Hispanic population is more than 80%, EPCC is uniquely positioned and qualified to provide a caring and supportive learning environment to this student population. Nearly 30,000 students -- 85% of whom are of Hispanic heritage -- are currently enrolled as full and part-time learners. Once a student has matriculated at ELCC, they’re able to choose from exciting associate degrees in topics like teaching, health careers, and business while deciding if they want to move straight into the job market or transfer to a four-year program. Students looking for an athletic component to their education can join the baseball, softball, or cross country teams. One of the fastest growing community colleges in Texas, Lee College saw the highest enrollment in its 82-year history last year, topping out at 7,300 learners. Nearly 60 associate degrees are currently on the roster, with the most popular programs including process technology, instrumentation technology, CADD engineering technology, general studies, and nursing. The majority of learners at Lee identify as minority students, and the school is regularly recognized for providing exceptional learning experiences. In 2015, the American Association of Community Colleges named Lee the winner of the Award of Excellence for Student Success. Learners who are currently or have previously served our country can take advantage of different resources and services at the Veterans Center, a department created in partnership with the Texas Workforce Commission. Meanwhile, aspiring student-athletes may be interested in playing basketball or volleyball at Lee, a member of the National Junior College Athletic Association. One of five schools in the Alamo Colleges District network, San Antonio College has educated students since 1925. Curricula from a catalog of approximately 75 associate degrees transfer to public four-year institutions in the state and beyond. Areas of study include business, computer science, radio-television broadcasting, and criminal justice. Students seeking to pursue careers as educators can enroll in the associate of arts in teaching program as the first step to prepare for Texas teacher certification in grades EC-6, 4-8, and EC-12 special education. One of the best schools in Texas at providing work-ready credentials, SAC also oversees a suite of 47 associate of applied science degrees and certificates in occupational fields. Learners in need of academic assistance can receive tutoring from the school’s math lab, writing center, and student learning assistance center. Qualified students can also apply for work study to help pay for college. Angelina College provides students with educational programming through a main campus in Lufkin and at several learning centers across Texas. The school specializes in a college transfer core curriculum and associate degrees, which students earn in 18-24 months of full-time study, although many learners at AC choose to enroll part time. Students complete the equivalent of the first two years of a baccalaureate program in fields such as healthcare, business, biology, engineering, and computer information systems. These degrees seamlessly transfer to many public colleges in the state. Learners planning to enter the workforce immediately after earning a diploma can pursue one of several occupational degree plans; AC is one of the top schools in Texas in terms of producing career-ready graduates. Degree options include child and family development, criminal justice, drafting and design technology, electromechanical technology, and human services with a case management specialty. AC students also have the opportunity to engage in several extracurricular activities through 20 student organizations and clubs. As one of the fastest growing community colleges in Texas, Ranger College has expanded its offerings to include additional campuses in Early and Stephensville, alongside an additional center in Brownwood and Comanche. Just under 20 areas of study at the associate level are currently available, ranging from agriculture and cosmetology to trucking and welding. When they aren’t in the classroom, students on campus take part in sports organizations, including basketball, cross country, golf, soccer, track, and rodeo. The 50-acre campus is a wooded rural location surrounded by rolling hills and lakes. Students from Australia, Russia, England, Saudi Arabia, and Mexico can be found studying alongside local students. As part of the Alamo Colleges District network, St. Philip's College has served the San Antonio community for 120 years. Students can enroll in career-focused associate degree and certificate programs, and much of the curricula at SPC can be seamlessly transferred to four-year institutions. Individuals seeking to enter the workforce directly after college may opt to pursue associate of applied science degrees in areas such as culinary arts, computer maintenance, construction technology, and web and mobile development. SPC also offers transfer degrees in business, criminal justice, computer science, and speech communication. The associate in arts in teaching prepares learners to transfer and pursue Texas teacher certification in grades EC-6, 4-8, and EC-12 special education. One of the best community colleges in Texas, SPC helps students in need of additional academic assistance by providing tutoring in subjects such as accounting, business, history, and computer literacy. The school also offers seminars for academic success and adaptive assistance for students with disabilities. One of the Texas community colleges operating as part of the Dallas County Community College District, Brookhaven College has been in operation since 1978. With a tuition rate of $59 per credit for residents within the county, Brookhaven is also one of the cheapest institutions in this ranking. More than 12,000 students elect to study at Brookhaven each year, taking advantage of associate degrees taught from areas of automotive technology, business, communications, health and human services, math and science, physical education, arts, social sciences, and world languages. Students who plan to move on to a four-year school after finishing their studies at Brookhaven will be pleased to know the school maintains transfer compacts with several institutions in the state, including Texas A&M, the University of North Texas, and the University of Texas at Dallas. Vernon College was among the two year colleges in Texas to receive a successful 5th year report from the southern Association of Colleges and Schools, and recently received millions of dollars in infrastructure funding and additional funds to increase scholarships programs. As the school continues to grow, students enjoy a vibrant community where academics are taught by knowledgeable and compassionate instructors. With 40 associate degrees currently offered, learners at this institution also have plenty of choices when it comes to their professional futures. Options are split evenly between transfer and career/technical programs, with the most unique programs including surgical technology; heat, ventilation, and air conditioning; farm and ranch management; and drama. Originally formed as part of the local public school system in 1948, ACC in Alvin exists as an independent, comprehensive institution. The school has continued to grow and thrive during the interim years and now offers just under 40 associate degree programs as AA, AS, and AAS programs. Students can pursue cornerstone classes for future four-year degrees in sociology, biological science, or communications. Those who want to begin their careers as a paralegal, pharmacy technician, or nurse immediately after graduating can also find programs at ACC. The College & Career Pathways department works to help students create individual learning plans that take into account prior learning, military credit, course sequencing, and university articulation agreements, making Alvin one of the best community colleges in Texas for undecided students. As one of the smaller two-year colleges in Texas, Western Texas College in Snyder caters to approximately 2,300 learners each semester. These numbers, which include a Hispanic population constituting 27% of the student body, qualify the school to receive federal funding for special programs under the Hispanic Serving Institutions program. Noted as one of the best value community colleges in the state, fewer than 4% of learners at the school need to take out student loans. Eight associate degrees are currently available, including general studies paths offered as an AS or AA, and six additional AAS degrees in areas of early childhood education, electrical lineman technology, information technology, petroleum technology, turf grass management, and welding. Among WTC’s unique features is the Great White Buffalo, the school’s radio station providing live broadcasts of WTC sporting events. What started 57 years ago as a small campus in Pasadena with a handful of students has evolved into the present-day version of San Jacinto Community College, with three campuses, 12 extension centers, and nearly 30,000 currently enrolled students. With nearly 200 associate degrees and certificates available, SJCC is also one of the most expansive community colleges in Texas. Whether aspiring to be a future audio engineer, interior designer, truck driver, or personal trainer, SJCC offers thoughtful, innovative programs that set students on their desired career path. While lots of career and technical programs are available, the school also maintains key relationships with public and private universities throughout the state for learners who want to continue their education after leaving community college. For those who need a bit of extra flexibility, the school has evening classes each semester alongside mini-sessions in the winter and spring that provide full credit for a three-week intensive course. Although Southwest Texas Junior College offers a range of associate degrees for individuals considering a four-year degree, 85% of all learners at this institution elect to move directly into a career upon graduation. As one of the two-year colleges in Texas focused on career and technical vocation training, learners enrolled at STJC can take advantage of a selection of associate of applied science programs, including air conditioning and refrigeration, automotive body repair technology, aviation management, and diesel technology. More than 5,600 learners take advantage of studies offered at the Uvalde, Eagle Pass, Del Rio, Prison, and Crystal City locations, with others completing programs at other educational centers or through online learning initiatives. Based in Waco, Texas, students at McLennan Community College learn on a main campus located along the Bosque River. Students at MCC can earn associate degrees in as little as two years of full-time study. The school's programming includes nursing, business, paramedicine, paralegal studies, and criminal justice with tracks in corrections and law enforcement. Students interested in pursuing a baccalaureate degree can take a block of courses at MCC that seamlessly transfers to programs at a four-year state college. One of the best schools in Texas for students seeking an alternative pathway to teacher certification, MCC offers a state-accredited program for learners who already hold a bachelor’s degree, helping them acquire specialized training. Participants take courses in pedagogy and content specialization and participate in a two-semester internship. Learners at MCC have access cutting-edge facilities and can engage in field research when appropriate. They also gain access to tutors, success coaches, and career services. Galveston College is located on a barrier island in the Texas Gulf Coast and is only 50 miles from the city of Houston, making its location unique among community colleges in Texas. The institution is home to 2,300 students completing credit programs, creating an intimate academic community where students can build their knowledge while also building professional and personal bonds. Students seeking a university transfer course can find 20 different programs to choose from, while those looking for career and vocational training can choose between degrees in computerized tomography technology, law enforcement, magnetic resonance imaging, or vocational nursing. For learners enrolled in a science, technology, engineering, or mathematics-related topic, the STEM Honors Program provides additional academic enhancements and support to promote success. Although Laredo Community College first opened its doors in 1947, the history of the beautiful 200-acre site has roots reaching far deeper. Settled into the Rio Grande banks, the site was initially used in the mid-1800’s to protect the frontier area of the town. In addition to the 42 associate degrees on offer, many of these programs also include additional specialization areas, such as the AAS in computer information systems with an available concentration in network and cyber security technology. When they’re done with classes for the day, students can take advantage of the Guadalupe and Lillia Martinez Fine Arts Center or learn about native flora and fauna at the Lamar Bruni Vergara Environmental Science Center. Athletics are also popular at LCC, where the Palominos plan men’s baseball, tennis, and soccer while female students compete in tennis, volleyball, and softball. The program is a Division 1 member of the National Junior College Athletic Association, making Laredo a great choice among community colleges in Texas for sports fans. As the second of the Texas community colleges to be opened under the banner of the Dallas County Community College District, Mountain View College has been providing two-year education since 1970. Accredited by the Southern Association of Colleges and Schools, the college is well positioned to provide innovative and engaging programs in more than 35 areas of study. Programs are delivered through its five different academic divisions: arts and communications; career and technical education; nursing; social sciences; and science, technology, engineering, and math. In addition to providing an Honors Program for academically motivated learners, the school is also home to the Omega Omega chapter of the Phi Theta Kappa Honor Society for students who maintain at least a 3.5 GPA. The college offers a range of merit- and need-based scholarships for students who need financial assistance. If you're thinking about applying to one of the best colleges in Texas, continuing reading to learn more about living in the Lonestar State. As the second-largest state in the U.S., Texas offers a diverse collection of climates, terrain and entertainment throughout its 268,820 square miles. Located on the U.S.-Mexico border, Texas has mountains, beaches, desert and plains, as well as a mix of small towns, bustling cities and anything in between. Western Texas is largely desert, though cold temperatures in winter are common. The northern Texas panhandle is part of the middle states' plains region, where it is fairly flat and prone to temperature extremes. The central part of the state is hilly and dotted with forest, rivers and lakes; the climate in this region is more temperate, making it an ideal location for outdoor enthusiasts. The coastal area, near Spring Break hotspot South Padre Island, is mild, wet and occasionally subject to hurricanes. The majority of Texas' 27,000,000 residents are clustered in the eastern part of the state, near the Dallas-Fort Worth area in the northeast, Austin and San Antonio in east central Texas or Houston, near the southeast shore. With a cost-of-living index 10% lower than the national average, living in Texas can be affordable. While its median household income is slightly lower than the national average, prosperous cities like Houston and Dallas are home to Fortune 500 companies and high-paying industries. The American oil industry has its roots in Texas, and the rapidly expanding healthcare industry is well represented. Texas is also one of only seven states that charge no personal income tax, making it a desirable place to live and work. Major Cities: Houston, San Antonio, Dallas, Austin, Fort Worth. The residency of a child under 18 is determined by his or her parent's legal address; parents must demonstrate a domicile in the state of Texas to receive in-state tuition. Children over 18 who are not emancipated by marriage or other court order must be a dependent of a Texas resident to receive in-state tuition. Dependency is established when a parent claims to financially support the student on a tax return. If you wish to be considered financially independent from your parents, you must prove this with appropriate documentation. For legal purposes, a domicile must have been a permanent place of residence for 12 consecutive months and must be where a person intends to stay. Children of divorced or separated parents living in separate states may only claim residency status in one; the primary parental domicile must be in Texas to receive in-state tuition. Families who have filed an I–485 application for permanent residency and have received a notice of action from the U.S. Citizenship and Immigration Services are considered residents. Eligible nonimmigrants must demonstrate a valid visa that permits U.S. domicile.